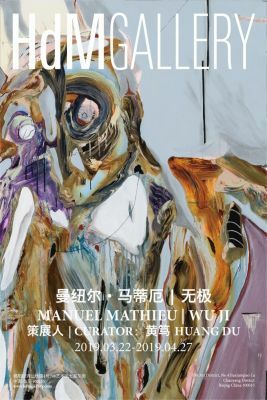 This March HdM GALLERY Beijing is pleased to present ‘Wu Ji’, a solo exhibition by Haitian painter Manuel Mathieu and curated by Huang Du. Announcing his arrival to the HdM stable of artists, this will be Manuel Mathieu’s first collaboration with the gallery. Following breakthrough shows in London, Paris and Chicago, the exhibition will be a unique opportunity to see his work in China. ‘Wu Ji’ will open on March 22nd and will be on display until April 27th 2019. Manuel Mathieu is a young artist who is working at the crossroads of abstraction and figuration. His works not only contain the passion of Haitian folk art, but also permeate the language tension of Baconian painting. This kind of cultural interweaving reflects the artist’s transnational experience and characterizes his distinct visual language. Although artists create seemingly distorted visual and thrilling form in an abstract or figurative way they are also able to stimulate the audience's curiosity, allowing them to experience existence, changes, association, life and death. The artist allows the audience to meditate on the artistic imagination across cultural boundaries and also to experience and express the fascination of humanity. Deeply embedded in the Haitian culture of his homeland, Manuel Mathieu’s work depicts a dark beauty and pays testament to Haiti’s turbulent history. Born in 1986 in Port-au-Prince, Mathieu grew up in a culture of political turmoil and his paintings often reference political events, hangings, funerals, such as in ‘Loyalty’ which depicts the funeral of Francios Duvalier, Haiti’s political leader, or genocides as in ‘Fort Dimanche’. Working at the crossroads of abstraction and figuration, his “kaleidoscopic” canvases depict biomorphic forms, dismembered body parts floating in a pool of fleshy tones. Breaking with the traditionally bright Caribbean colour palette, he opts for murkier shades, purples, blues and browns which conjure up the bruised corpses of his subject matter. Named after the protagonist in Jacques Roumain’s 1941 seminal Haitian novel Gouverneurs de la rosée, or Master of the Dew, Mathieu draws on Haiti’s artistic and literary legacy in his painting. Meaning ‘Infinity’, the title of the exhibition ‘Wu Ji’ is significant as Mathieu describes his practice as “nurturing a bridge with infinity.” Deeply personal as well as historical, Mathieu’s work explores themes of family, identity and remembrance as well as politics. The paintings are a way of understanding his own past as much as Haiti’s history. Raging with a violent, visceral energy the paintings reflect Mathieu’s own close brushes with death; he was severely injured in a motorcycle accident suffering significant memory loss whilst studying for his Masters at Goldsmiths University. However, the incident marked a turning point in his career with his recovery period leading him to produce work that would be featured in the 2018 exhibition ‘Nobody is Watching’ at the Kavi Gupta Gallery in Chicago. His work is often autobiographical featuring self portraits or members of the artist’s family such as in ‘Family Portrait’, one of the works on display in the exhibition. An interdisciplinary artist, Mathieu works across a range of media and the work in ‘Infinite’ features both drawings and paintings from the artist’s oeuvre. Using a variety of processes like scratching and frottage, drawing, and dripping he describes “destroying” the images before rebuilding them. His influences are broad and include the work of Clifford Still, Cornelia Parker and Jasmin Joseph as well as Haitian folk art. After receiving his Bachelors degree in Visual and Media Arts from the University of Québec in Montréal Mathieu went on to complete his Masters in Fine Arts at Goldsmiths University in London. He has exhibited internationally including at the ICA (Institute of Contemporary Art) and Tiwani Gallery in London, the Grand Palais in Paris, the Museum of the Americas in Washington D.C and the Kavi Gupta Gallery in Chicago and his work features in national collections in both Canada and Haiti. He has participated in leading art fairs such as the Armory show and Frieze New York and Art Basel Miami. Mathieu lives and works in Montreal, Canada. *About Curator——Huang Du is the curator and art critic in Beijing. He is the academic director in Today Art Museum, professor in Institute of the Sociology, Sichuan Academy of Fine Arts and professor in Institute of Experimental Arts, Tianjin Academy of Fine Arts. He has published numerous critical articles and essays on contemporary art, mostly on magazines and catalogues in many countries. As a speaker and jury member, he was invited to participate in many important international art symposiums and art awards, including CCAA, The 7th Taishin Art Award 2009, Nissan Art Award 2013, “Lorenzo il Magnifico” of International Award of The 10th and 11th Florence Biennale 2015, 2017 and Yishu 8 Prize-China 2015-2018. The important exhibitions he curated in recent years are: Familiar Otherness: Art Across Northeast Asia; A Nomadic Life: Francesco Clemente in China; BRIC-à-brac, The Jumble of Growth, Another Choice: The Third Today’s Documents (co-curator with Gerardo Mosquera), and it was toured to Roma Galleria Nazionale d’ Arte Moderna e Contemporanea in 2018.